Written for mathematicians working with the theory of graph spectra, this book explores more than 400 inequalities for eigenvalues of the six matrices associated with finite simple graphs: the adjacency matrix, Laplacian matrix, signless Laplacian matrix, normalized Laplacian matrix, Seidel matrix, and distance matrix. The book begins with a brief survey of the main results and selected applications to related topics, including chemistry, physics, biology, computer science, and control theory. The author then proceeds to detail proofs, discussions, comparisons, examples, and exercises. Each chapter ends with a brief survey of further results. The author also points to open problems and gives ideas for further reading. Preface; 1. Introduction; 2. Spectral radius; 3. Least eigenvalue; 4. Second largest eigenvalue; 5. Other eigenvalues of the adjacency matrix; 6. Laplacian eigenvalues; 7. Signless Laplacian eigenvalues; 8. Inequalities for multiple eigenvalues; 9. Other spectra of graphs; References; Inequalities; Subject index. 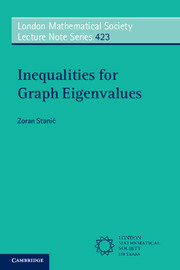 Zoran Stanić is Assistant Professor in the Faculty of Mathematics at the University of Belgrade. He has published around 40 scientific papers. His current research interests are algebraic graph theory, numerical mathematics, and computer science.